With the litigious world we now live in, it is imperative for us to comply fully with the Health and Safety legislation, not only to give you peace of mind but also to assure the safety of our team. To take further precautions to make sure we are in accordance with this legislation, for several years we have been audited and accredited by Safe Contractor. As part of any work activity we are required to carry out a site-specific risk assessment, which once in place is then reviewed each and every year for the period of the contract. 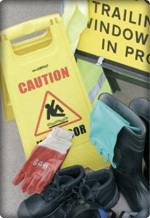 This ensures constant care over the safety of our team on site. We are also members of the Federation of Window Cleaners, which helps us stay informed of issues that impact this specific business sector. Rest assured that our team is trained to the highest standard in order to give the best possible results in a safe and efficient manner. Also finally, we carry appropriate Public and Employers Liability Insurance, details of which we are happy to provide upon request.